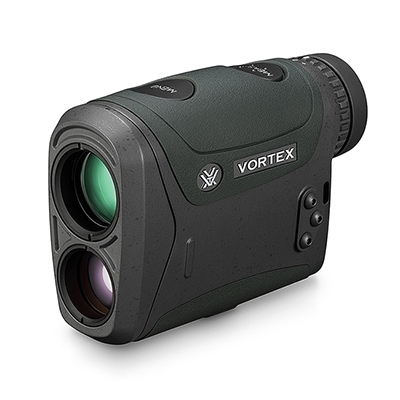 Weighing in at 9.9 oz and just 4.5” long, the Vortex Razor HD 4000 7x Laser Rangefinder proves that big things do come in small packages. The Razor 4000 has ranging capabilities of up to 4000 yards (or 2.27 miles) on reflective targets and will easily range a deer or larger sized game out to 2200 yards. The device uses Vortex’s HD Optical System and XR™ Plus Multi-Coat Lens Coating to provide the user with crystal clear images in most lighting conditions. The Vortex Razor HD 4000 is built to withstand any hunt with a robust outer shell and IPX7 waterproof rating. Additionally, the rangefinder uses the ArmorTek® lens coating to protect the glass from scratch or chipping damage due to debris or accidental drops. The Vortex Razor HD 4000 LRF offers two ways to secure it to your person, a tension clip and lanyard/strap.